Welcome to my teaching page. 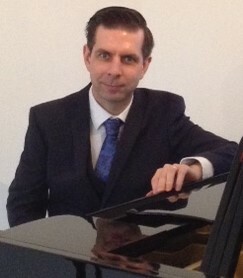 I’m an experienced DBS enhanced checked piano teacher who’s just moved to Wadhurst with my wife Lorna. I’ve been teaching privately for over 20 years. I offer friendly, unpretentious piano lessons and teach beginners in a fun and easy to understand way. You can learn to play on a beautiful grand piano! All ages are welcome from beginners to advanced (up to teaching diploma). I’ve coached many pupils to success in their ABRSM and Trinity Board exams for piano, electronic keyboard and music theory. I’ve also coached GCSE to A grade level. I also have experience of teaching children electronic keyboard from age 5 to 16+ in groups classes in London schools for 8 years. From 2001 to 2016 I did supplementary work as an accompanist for ballet classes and exams for dance schools, including the Lorna Clark School, (for over 10 years), in Harrow; Sole School in Ruislip; the Margaret Howard Theatre College in Watford and on occasion at the RAD. I also worked for years at highly respected independent schools St Helens, Northwood and Northwood College as an accompanist for dance classes and exams. I have a wide range of knowledge and teaching experience encompassing classical, jazz and pop performance and interpretation, composition, theory, music production and recording. I aim to ensure pupils can read music in both hands and that they understand the basics of keyboard harmony. This will enable children the choice to be able to play piano or electronic keyboard and can only be a valuable assest for pupils who already demonstrate a naturally good ear. I encourage all styles – classical, jazz and pop and am happy to help pupils play favourite pieces or songs they are interested in or inspired by. I’ve made many arrangements and transcriptions of pieces for pupils which I hope has inspired them and given them great enjoyment. I look forward to helping more pupils play, read and enjoy music.